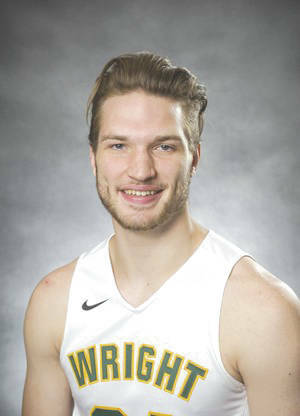 FAIRBORN — Bill Wampler, a junior for the Wright State University men’s basketball team, will be one of 10 players who will represent the United States at the upcoming FISU America Games in São Paulo, Brazil. The Fédération Internationale du Sport Universitaire (FISU) is the governing body that supports the America Games, which is a 13-sport, collegiate-level tournament featuring 20-25 nations from North and South America. The event is similar to the Pan-America Games. The US-IUSF, which is the official governing body for the United States in all FISU events, fields teams in 10 able-bodied sports and three Paralympic sports. The opening ceremony is set to take place, Friday, July 20. Basketball competition will take place July 24-28 at the recently-constructed Brazilian Paralympic Center. Athletes in Action, a Christian-based organization based in Xenia that emphasizes the intersection of sports and the Bible, was delegated by US-IUSF to select the squad to represent the United States. Wampler, a 6-foot-6 transfer from Drake University, sat out last season after averaging 9.6 points and 2.5 rebounds as a sophomore for the Bulldogs. He averaged 22.2 minutes with three games of 20 points or better. Joining the Eau Claire, WI native on Team USA is Shannon Bogues (Stephen F. Austin), Eli Cain (DePaul), Plandrous Fleming (Charleston Southern), Markus Golder (Valparaiso), TJ Holyfield (Stephen F. Austin), Joshua Nebo (Texas A&M), Tayler Persons (Ball State), Frederick Scott (Rider) and Drew McDonald (Northern Kentucky). Wampler and Team USA report to the Athletes in Action training facility in Xenia, on Saturday, July 14, for training camp with workouts at WSU’s Setzer Pavilion in Fairborn. The team then departs for São Paulo on Wednesday, July 18. The Wright State University Raiders men’s basketball team finished last season with 25 wins and the 2018 Horizon League Tournament title to advance to the NCAA Tournament for the first time since 2007. Story courtesy of Wright State University Athletics, wsuraiders.com.